This is the last installment of my three-part study of William James, a philosopher I find uniquely compelling. William James was born in New York City in 1842, spent most of his adult life at Harvard University, and died in 1910 at his home in New Hampshire. He originally trained to be a medical doctor, and in this capacity he spent his early academic career absorbing the fascinating writings of new European "psychologists" like Ivan Pavlov and Sigmund Freud. He represented America at international conferences devoted to this then-controversial discipline, helped found Harvard's psychology department, then left the field to turn his attention towards epistemology and philosophy, where he would have his greatest influence. William James's best books include The Varieties of Religious Experience, The Principles of Psychology and Pragmatism: A New Name for Some Old Ways of Thinking. His books are a breezy pleasure to read, and the arguments they present are not only enlightening but also heartening. Reading a book by William James can feel like escaping from jail. His approach to difficult or age-old philosophical debates like the free-will question is to point out that taking any stance on this question is a self-defining action that will determine the apparent "truth" about the matter. The truth does not define the stance; rather, the stance defines the truth. James demonstrates this with his answer to the free will question: "My first act of free will is to believe in free will". James's concept of truth, which he labelled "Pragmatism" (building upon the work of an earlier American philosopher, Charles Peirce, who used the term "pragmatism" in a less forceful way), became his claim to fame. Interestingly, William James was not the only famous intellectual in his immediate family; the great novelist Henry James was his younger brother. 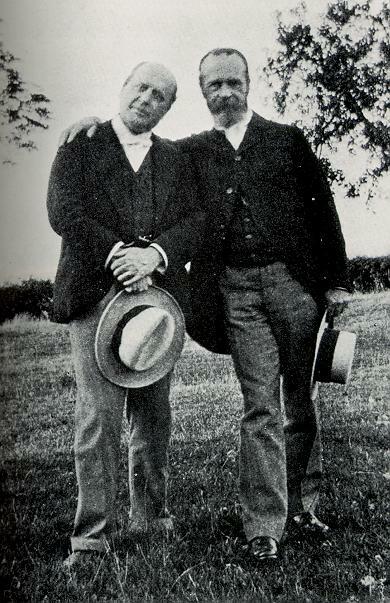 According to Leon Edel's classic biography of Henry James, the two brothers were close in age but never in temperament. William, the family's eldest, conducted himself with a purposeful moral seriousness, whereas Henry had a puckish sense of humor and a wholly artistic view of life. In the way that close siblings sometimes do, William and Henry seem to have strictly defined their intellectual borders to oppose and exclude each other. William was generally disinterested in literature and fiction, and Henry scoffed gently at philosophy. The two even seemed to avoid each other physically; William left New York for the green pastures of Harvard University, and Henry abandoned America entirely, so fully losing himself in the rich pleasures of English dinner parties and literary salons that he is often mistaken for a European writer. A thick Penguin Classics edition of Henry James's letters gives us a direct glimpse at the relationship between the two brothers. They clearly liked and respected each other, but they did not write often, and when they did they tended to chat about the health of their parents, the activities of their three younger siblings and other impersonal matters. But what, I am dying to know, did William think of Henry's remarkable novels? And what did Henry think about his brother's groundbreaking and controversial academic work? I read your Golden Bowl a month of more ago, and it put me, as most of your recenter long stories have put me, in a very puzzled state of mind. I don't enjoy the kind of 'problem,' especially when as in this case it is treated as problematic (viz. the adulterous relations betw. Ch. & the P.), and the method of narration by interminable elaboration of suggestive reference (I don't know what to call it, but you know what I mean) goes agin the grain of all my own impulses in writing; and yet in spite of it all, there is a brilliancy and cleanness of effect, and in this book especially a high toned social atmosphere that are unique and extraordinary. Your methods & my ideals seem the reverse, the one of the other -- and yet I have to admit your extreme success in this book. But why won't you, just to please Brother, sit down and write a new book, with no twilight or mustiness in the plot, with great vigor and decisiveness in the action, no fencing in the dialogue, no psychological commentaries, and absolute straightness in the style? Amazingly, William James seems to have wished for Ernest Hemingway as a younger brother, though the world would be much poorer for it. All this time I'm not thanking you in the competent way for your 'Pluralistic' volume -- which now I can effusively do. I read it, while in town, with a more thrilled interest than I can say; with enchantment, with pride, & almost with comprehension. It may sustain & inspire you a little to know that I'm with you, all along the line -- & can conceive of no sense in any philosophy that is not yours! Praise is the major note in this letter, yet Henry sneakily speaks in negative outlines: the novelist can conceive of no sense in any other philosophy, but it is not clear that he conceives of sense in any philosophy at all. Henry James grasped the power of pragmatism, but many of his novels feature pragmatic and manipulative villians who destroy the lives of starry-eyed innocents. Gilbert Osmond, Doctor Sloper and the Marquise de Cintre are entirely willful and pragmatic (if not Pragmatistic); Isabel Archer, Catherine Sloper and Christopher Newman are their victims. There is a danger of over-dramatizing the intellectual gulf between these two liberal thinkers, who clearly respected each other tremendously. Perhaps it's best to conclude that vast significances lie between the Apollonian opinions of the Harvard professor and the Dionysian observations of the London socialite. Both brothers seemed to have liked their younger sister Alice better than they liked each other. Maybe there was just too much brilliance abounding in the room for a single family dinner table to comfortably contain. This article is part of the series William James. The previous post in the series is My So-Called Truth: William James and the Will to Believe. 10 Responses to "William James: Henry James’s Smarter Older Brother"
A well-researched synthesisThis is a well-researched synthesis of philosophy and literature. Fascinating stuff. I'm gradually reading The Varieties of Religious Experience, a little bit at a time, between Steve Aylett books. What I've read of this book so far brings to mind the AA concept of a "higher power," which can mean different things to different people. Ahhhh....BrothersWhen I think about Henry James all I can think about is an American longing for a London that never existed...like if an American Morrissey wrote novels. But I don't really know why I think this.H. James is obviously a sophisticated dude, and as far as dreamers of his time, he seems ahead. And so who better to check these rampant dreams but his own brother..."He's really, I won't say a yankee, but a native of the James family, and has no other country"...William is like the voice of reason I suppose...but there are those masses still who love the dreamer. You can find William in the psych textbook, and Henry in the lit class, and really who is to say which is more correct. William and Henry, Foucault and Plato...It all rides a fine line and it is all great. Stephen King for example, said that writing is just telepathy. It is amazing that both James brothers still appeal to large segments of the world, although they engaged in (friendly) competition throughout their respective careers. Oh, also, I like your title to this piece - an allusion to Mycroft Holmes, no doubt. is jamesthe one who wrote 'the beast' ?I think I had tried that and couldn't get it goingHis brother's philosophy sounds interesting, and I agree their relationship is intriguing. Becoming William JamesYou may enjoy an 'analysis-biography': "Becoming William James" by Howard M. Feinstein. It goes into the relationships between all members of the family; most interestingly, between William and Alice. While it does not investigate the brothers' differences via their work to the depth that one might like, it is an interesting introduction to a fascinating family petri dish.Related anecdote: Howard Feinstein was my first analyst. He reassured me that "...my problems were just like William James'." And that coincidentally I could save $ (I was a student, he was full-price) on a couple of sessions by picking up the book, which had just come out. The reassuring thing turned out to be that my problems were NOTHING like William James', which if you read the book you will see why that was reassuring! Be sure to check out the cartoons. Wow, never knew this book existed. Thanks! 'The Beast in the Jungle', yes, that is one of his well-known short stories.My favorite Henry James short stories are 'The Real Thing' and 'Aspern Papers'.